Beautiful 14K Yellow Gold Charm of " Ring with With Pearl "
Beautiful 14K Yellow Gold Charm With Pearl. 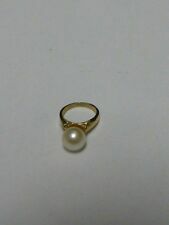 This item is a wonderful 14K Yellow Gold Charm that looks like a. baby ring with a pearl as a main stone. This item is adorable. a ring sizer. The PANDORA Secret Charm is 14K Yellow Gold and features 0.02 ct diamond accents and a dangling white freshwater cultured pearl. This Authentic Pandora 14K Gold Secret Diamond with Pearl Charm is pre-owned in excellent condition and the markings are clearly visible. There are charms, bracelets, rings, and necklaces. Check them out! Amore La Vita Charm Jewelry. It is easy to "Love Life and All Things in it!". with Amore La Vita Charms. Main Stone: Freshwater Cultured Pearl. Style: Charm(s). Explore and have fun with more than 900 Rhoium-plated Sterling Silver charms to choose from, no matter what your age, no matter what the occasion, anyone can design a beautiful charm bracelet or chamr carrier for your favorite necklace. Authentic Bonn Bons She Devil Charm. To be used with Bonn Bons Charm bracelets, rings and necklaces. Limited Edition. I am a trading assistant. Amore La Vita Charm Jewelry. It is easy to "Love Life and All Things in it!". with Amore La Vita Charms. Main Stone: Freshwater Cultured Pearl & Glass. Explore and have fun with more than 900 Rhoium-plated Sterling Silver charms to choose from, no matter what your age, no matter what the occasion, anyone can design a beautiful charm bracelet or chamr carrier for your favorite necklace. Amore La Vita Charm Jewelry. Main Stone: Freshwater Cultured Pearl. It is easy to "Love Life and All Things in it!". with Amore La Vita Charms. Explore and have fun with more than 900 Rhoium-plated Sterling Silver charms to choose from, no matter what your age, no matter what the occasion, anyone can design a beautiful charm bracelet or chamr carrier for your favorite necklace. •Feature:Lobster Clasp. •Plating:Rhodium. •Stone Type_1:Pearl. •Pendant/Charm Type:Pearl. •Pearl Type_1:Freshwater. •Material: Other:Glass. •Sold By Unit:Each. •Feature 3:Solid. Pandora Charm. Pre-Loved,but in great shape for any Pandora fan. 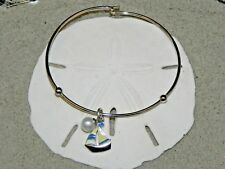 Sterling Silver Mother of Pearl. 100% Authentic. Ask for Abby or AJ. Diamonds total 0.4ct. -- Heart charm. “Master jewelers for seven generations.”. OUR APOLOGIES. Previously owned. -- Pavé diamonds one side, mother-of-pearl on the other. The item pictured is always the actual item for sale. •Feature:Lobster Clasp. •Plating:Rhodium. •Stone Type_1:Pearl. •Pearl Type_1:Freshwater. •Material: Primary:Sterling Silver. •Plating Color:Silver Tone. •Sold By Unit:Each. •Stone Color_1:White. •Feature:Lobster Clasp. •Plating:Rhodium. •Stone Type_1:Pearl. 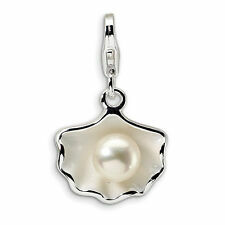 •Pendant/Charm Type:Pearl. •Pearl Type_1:Freshwater. •Sold By Unit:Each. •Material: Accent Color 1:Red. •Feature 3:Solid. •Plating:Rhodium. •Feature:Lobster Clasp. •Plating Color:Silver Tone. •Stone Type_1:Pearl. •Pendant/Charm Type:Pearl. •Pearl Type_1:Freshwater. •Sold By Unit:Each. •Material: Accent Color 1:Red. •Plating:Rhodium. •Feature:Lobster Clasp. •Plating Color:Silver Tone. •Stone Type_1:Pearl. •Pearl Type_1:Freshwater. •Sold By Unit:Each. •Material: Accent Color 1:White. •Stone Color_1:White. Pearl Rings. Snake Chains. Diamond Rings. Pearl Earrings. Anchor Chains. Semi Mount Rings. Jewelrypot is dedicated towards providing you with the best quality, service, and prices of fine diamond, gemstone, pearl, and silver jewelry. Feature:Lobster Clasp. Freshwater cultured pearl. Stone Type_1:Pearl. Fancy lobster. Material: Primary:Sterling Silver. 20 Years Experience In Jewelry. SILVER JEWELRY. GOLD JEWELRY. Feature:Lobster Clasp. Freshwater cultured pearl. Stone Type_1:Pearl. Fancy lobster. Material: Primary:Sterling Silver. SILVER JEWELRY. GOLD JEWELRY. Pearl Type_1:Freshwater. •Feature:Lobster Clasp. •Plating:Rhodium. •Bail Width:3 mm. •Bail Length:9 mm. •Stone Type_1:Pearl. •Pendant/Charm Type:Pearl. •Pearl Type_1:Freshwater. •Stone Color_1:White.